Odyssey is our range of beers on a journey through barrels and blends. Each is a unique creation, usually inspired by a concept that we want to bring to life, or a natural fit for barrels with intense and specific character that we pick out as being particularly suited to a blend. We're now delighted to be ready to unleash Odyssey 008. The idea for this beer was to create a blend inspired by dark Belgian wood-aged sour beers, based on the character of a few unique and long-term aged beers in the barrel store. At the time of blending, we sent out a couple of preview kegs to events in the summer, and it was featured in bottles as one of the pairings in our dinner event at Carnivale Brettanomyces June 2017 in Amsterdam. Two more kegs are going out to festivals - at this weekend's Dark City in Leeds we're presenting a version of the blend from a single red wine barrel, with no fruit additions (9% ABV). At NaparBCN's Sour & Lambic fest, we're pouring a keg drawn from one of the fruited barrels. This was a bourbon barrel with blackcurrants added at ~110g/L (8.6% ABV). We'll also be releasing Odyssey 008 in our special 375ml bottles - this final blend will come in at 8.7% ABV. 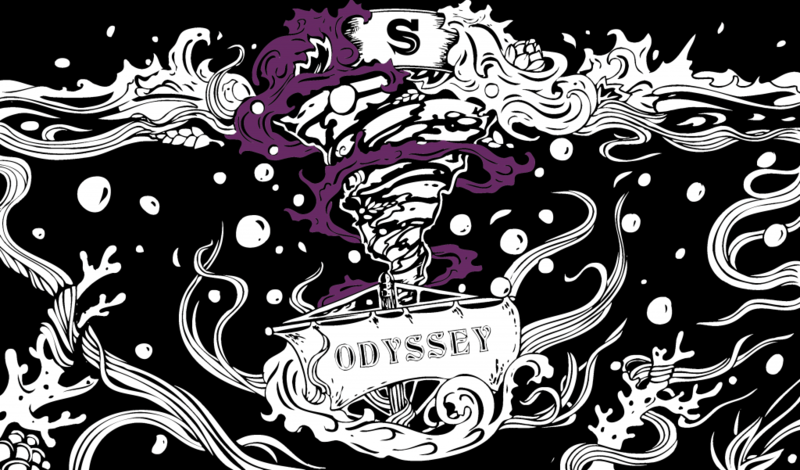 The blend for Odyssey 008 consists of: Liquid Mistress - Red Wine Barrel Aged with Brettanomyces Funky Feet (Collaboration with Stillwater Artisanal & Le Grappin - White Wine Barrel Fermented Ratchet (Collaboration with Prairie Artisan Ales) - White Wine Barrel Aged Maiden - Red Wine Barrel Aged Broken Dream - Red Wine Barrel Aged with Brettanomyces and Bugs Jack Tarr - A Smoked Mild Aged in Red Wine Barrels with Brettanomyces Acid Jam - Red Wine Barrel Aged (Original blend released earlier this year) Calypso (Fresh from the tank for vibrancy) The barrel-aged beers were selected for their aroma and acidity. After blending the beer was returned to barrels for another 3 months (in red wine barrels from which part of the original blend was drawn, plus some bourbon barrels which previously housed Acid Jam). A small addition of seasonal British fruit was added to some of the barrels. The fruit additions total ~75g/L in the overall blend, consisting of 40% cherries and 60% blackcurrants. The resulting beer has a gorgeous oak character with prominent red wine tannin influence, bramble & berries and a fruity acidity on the palate. Of course there's a complexity too, and our tasting notes pick up floral notes, almonds, umami and a delicate funkiness from the brettanomyces. As always, we'd love to know how your tastings compare.